After attempting skills over direction in 'Theevram', filmmaker Roopesh Peethambaran is all set to make a comeback with his next venture which features a handsome number of young brigades in lead. The movie titled 'You Too Brutus' starring Asif Ali, Sreenivasan, Aju Varghese, Anu Mohan, Ahammed Siddique and Tovio Thomas in male leads and Honey Rose, Rachana Narayanankutty and Ena Saha in female lead is currently undergoing shoot at Thrissur. The innovative first look poster of the movie having animal faces instead of the cast members depicts the animal nature in each character. 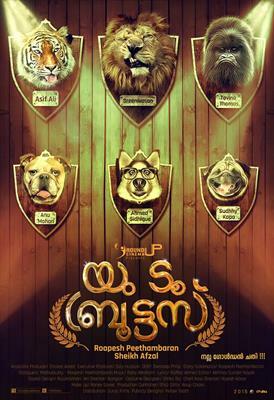 In the poster, Sreenivasan is represented as a lion, Asif Ali a tiger, Tovino Thomas a gorilla, Anu Mohan a bulldog, Ahmed Siddique a fox, Sudhy Kopa a pug, Honey Rose a cat, Rachana Narayanankutty a cow and Ena Sahaa as a puppy. As the title of the movie sounded serious, that notion was broken with the posters. Rachana will play an IT professional in a different look with a new hairdo and modern outfit while Asif Ali plays her husband. A makeover video of Molly Kannamaly featured in a never seen avatar has already gone viral over social media site. She is also doing a prominent role in the movie. Meanwhile, the one film old director who acted the younger version of Mohanlal in the blockbuster, 'Spadikam' has also shared his plans to make a biopic based on legendary filmmaker John Abraham. After his hectic projects, Roopesh is taking a break from filmmaking for one or two years for doing an extensive research on the film. The interest reached the peak as he came across a few interesting clips and stories of John Abraham. The movie set in the 1970s will zoom into interesting incidents that have happened in his life. Actor Asif Ali will be having a busy schedule this year with a number of projects in kitty. He will be a part of Nirnayakam, Adventure of Omankuttan, Driver on Duty, Double Barrel, Happy Birthday, St Peter's Day and Reghuram Varma's untitled project in 2015.